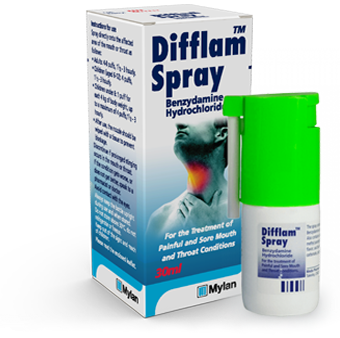 Difflam™ is a fast acting, long lasting treatment for sore throat and mouth conditions. 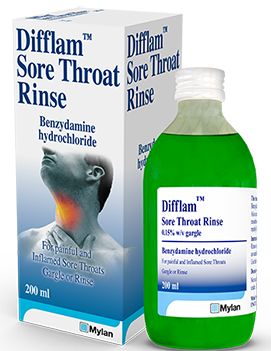 Difflam™ Spray delivers fast-acting sore throat relief for all the family, including children under 6. To support the body's natural healing process and help you feel better sooner. 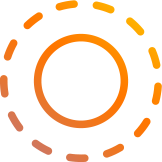 See information about the Difflam™ range of products and their indications, as well as a quick reference guide. 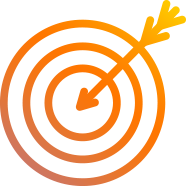 Information outlining the findings of studies supporting Difflam™ and its active ingredient, Benzydamine Hydrochloride. Difflam™ 3% Cream is a topical analgesic and non-steroidal anti-inflammatory agent for the treatment of sprains, strains, contusions, sore muscles and stiff joints. This site is designed for UK healthcare professionals. If you are not a UK healthcare professional please click here to visit our customer website. This site is designed for UK healthcare professionals. If you are not a UK healthcare professional, please click here to visit our customer website.